Far from being Rick Rolled, there have been rumblings about the former Stock Aitken Waterman star touring Australia for a few months now, but here it is… locked in, settled, confirmed. 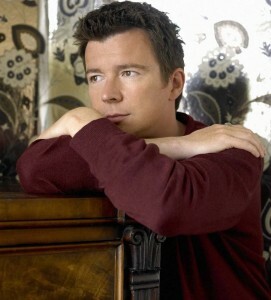 Rick Astley will tour Australia in November this year. It’s the first time in an extraordinary 23 years that the singer will play live down under, so he’s making up for it by raiding the back catalogue and performing all the hits that made him famous, including the inimitable ‘Never Gonna Give You Up’, PWL favourites ‘Together Forever’ and ‘She Wants To Dance With Me’, the ballad ‘When I Fall In Love’ and the ’90s classic ‘Cry For Help’. Tickets for all dates are on sale on Monday July 09, with the exception of the Albury date, which is on sale now. See the previous comment (#2), who saw him at the Entertainment Centre in Brisbane. I know he toured in 1989 but can you tell me what venue and what date? I attended as a volunteer. I think it was Bris Ent Centre Boondall or QPAC. Only got to see one song. It was good. Hope he comes back again. Maybe next year 2014? Hi, Rick definitely has toured before as I distinctly recall seeing him at Brisbane Entertainment Centre, touring on his second LP.